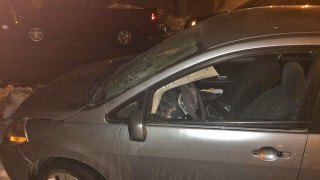 A Logan Square woman trying to head to work early Monday morning says she found her car destroyed -- inside and out -- and thinks Chicago's unofficial "dibs" practice could have something to do with it. "It was essentially bombed by presumably some very large firecracker and beaten with some sort of mallet or hammer," Ashley Mater told NBC Chicago. The ordeal began before 4 a.m. on Feb. 10. Mater said she went out to her 2011 Nissan, parked on the east side of the 2500 block of North Hamlin Avenue, and saw the carnage. There were no "dibs" in the spot, though she said there was some junk sitting nearby which could have been dibs items that had previously been removed. 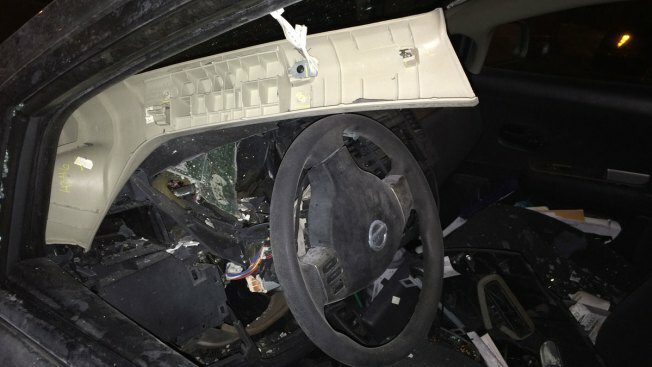 Nothing was stolen from the car, but the damage was severe: the windshield was shattered, the side windows were smashed in, and her dashboard and steering column were destroyed. Insurance is covering the estimated $5,000 worth of damage, but it'll be about two weeks before Mater gets the car back that she normally uses to get to her job in the suburbs. "Anybody who is doing this for dibs, you're going too far," Mater's sister, Meghan Mater, said Thursday. Under the illegal dibs system, people who shovel out parking spots after a snow storm informally lay claim to them for days by leaving items, such as furniture or garbage cans. Last weekend, a Ukrainian Village woman reported that someone cut the brake lines on her car because she ignored the dibs rule and parked in a spot that was "claimed." Mater immediately reported the vandalism to police and later decided to reach out to the press. "The reality is that I am frightened for myself, but I am even more so, especially frightened for the remaining residents of our city," Mater said via email. "I repeatedly picture an image of someone standing near my car by some coincidence at the time of the incident and getting injured, or worse. 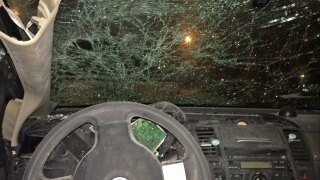 I'm not sure why my car was targeted, as I have no known bad ties or 'enemies' to my knowledge. That means one thing: this could happen to anyone." Though Mater says she's not surprised to hear of crime happening, she expressed shock at the way by which she became a victim. "Come on though, explosives??? Who does that?? ?," she wrote. Crews from Chicago's Department of Streets and Sanitation will begin collecting "dibs" items on Friday.